In hypertrophy the heart muscle becomes thicker. This can have different causes. Left ventricular hypertrophy results from an increase in left ventricular workload, e.g., during hypertension or aortic valve stenosis. Right ventricular hypertrophy results from an increase in right ventricular workload, e.g., emphysema or pulmonary embolization. These causes are fundamentally different from hypertrophic obstructive cardiomyopathy (HCM), which is a congenital misalignment of cardiomyocytes, resulting in hypertrophy. LVH. R in V5 is 26mm, S in V1 in 15mm. The sum is 41 mm which is more than 35 mm and therefore LVH is present according to the Sokolow-Lyon criteria. 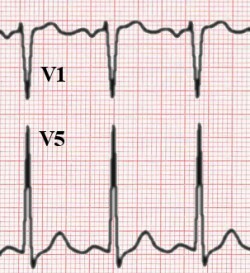 As the left ventricular wall becomes thicker, the QRS complexes become larger. This is especially true for leads V1-V6. The S wave in V1 is deep, the R wave in V4 is high. Often some ST depression can be seen in leads V5-V6, which is in this setting is called a 'strain pattern'. R in V5 or V6 + S in V1 >35 mm. This criterion is not reliable below age 40 years. In 10-29 year olds, the 99th percentile for SV1+RV5 is 53mm. In 20-39 year olds: 32% have SV2+RV5 > 35 mm. Correlation between LVH on ECG and echocardiography is low with ECG having a sensitivity of 27% and specificity of 88% for echocardiographically measured LVH. Moreover, both are independent estimators of worse prognosis.. This is a better predicting criterion than the Sokolow-Lyon criterion, but less easy to remember, and therefore less often used. In the Romhilt-Estes Score LVH is likely with 4 or more points. LVH is present with 5 or more points. Romhilt has reviewed ECG LVH criteria and gives an overview of the many LVH scoring systems. Left ventricular hypertrophy has prognostic consequences as has been found in several studies. Another example of extreme left ventricular hypertrophy in a patient with severe aortic valve stenosis. ECG of a patient with LVH and subendocardial ischemia leading to positive cardiovascular markers in blood testing. An example of right ventricular hypertrophy (and right atrial enlargement) in a patient with chronic pulmonary hypertension due to peripheral embolisation. Another example fo right ventricular hypertrophy. Right ventricular hypertrophy occurs mainly in lung disease or in congenital heart disease. 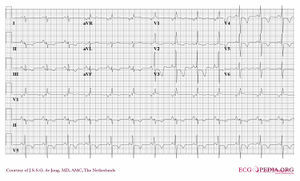 The ECG shows a negative QRS complex in I (and thus a right heart axis) and a positive QRS complex in V1. Left atrial enlargement with ECG. Left atrial enlargement as seen in lead V1. 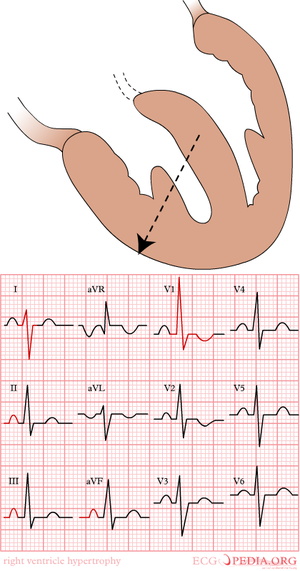 Left atrial enlargement is often seen in mitral valve insufficiency, resulting in back flow of blood from the left ventricle to the left atrium and subsequent increased local pressure. P >1.5 mm in V1. Right atrial enlargement can result from increased pressure in the pulmonary artery, e.g. after pulmonary embolization. A positive part of the biphasic p-wave in lead V1 larger than the negative part indicates right atrial enlargement. The width of the p wave does not change. 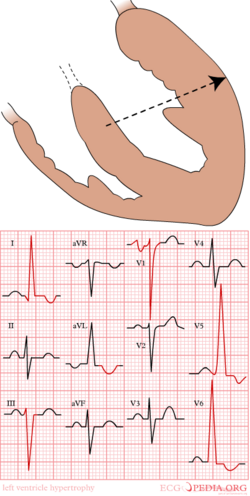 In biatrial enlargement the ECG shows signs of both left and right atrial enlargement. In V1 the p wave has large peaks first in a positive and later in a negative direction. This page was last edited on 8 October 2014, at 09:59.